Last week we attended a graduation ceremony for 11 new recruits for our local fire department. It was extremely moving to see these guys all lined up on the platform, having gone through a rigorous training time, then taking an oath, pledging to serve and protect and helping those who are in need. Afterward, they received a handshake, and a hearty “well done” plus the reward of officially being welcomed into the fire department. Their attitude and the effort they put forth was commendable. It was especially moving because my husband Steve is the senior chaplain for this particular fire district. He was chaplain for a fire department in Michigan for 13 years and did a great job. (This is not only my opinion, but many more.) Now he’s the chaplain for this department. I’m so very proud of him. I’m also happy for the men who will have the opportunity to work with him, as God leads, during both good and tough times. The motto that these recruits lived by during their training as fire fighters is to put forth their best ATTITUDE and EFFORT. This was and will be continually emphasized to them. 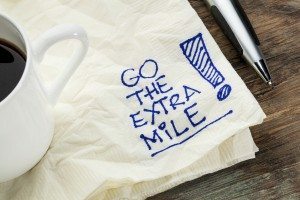 They are challenged to go the extra mile. As this motto was being spoken about, I thought of how this applies to our walk as Christ followers, and as spouses. The attitudes and the effort we put forth can either help or hurt those around us. If we slack off in either of these areas of living and loving, someone can get hurt. As Christ followers, and as husbands and wives, we’re to put forth our best attitude and best effort. There doesn’t appear to be an “if” clause within scripture that says IF “he (or she) would just…” or IF “she (or he) wouldn’t…” then we would act differently. We’re called to do everything “as unto the Lord” with His guidance. Not only will this please the Lord on this side of heaven, but also when we “graduate” to Heaven some day, we will hear the words being told to us, “well done, good and faithful servant” and receive our heavenly reward. This morning I came across the scripture in Ephesians 5:29-30, which is told to husbands, but also applies to wives. We are told that, “no one ever hated his own flesh, but nourishes and cherishes it, just as Christ does the church, because we are members of His body.” I thought of how our ATTITUDE is to be one that “nourishes.” We are to put forth our best EFFORT to show that we “cherish” our spouse. This is shown by the things we do and say. If we continually remind ourselves of that, our marriages will truly reveal and reflect the heart of Christ. Sometimes our love must be tough, “speaking the truth in love.” Other times it is to be soft and tender. But it is always to reflect how God wants us to treat each other. Another motto of the fire department (and Marines) is “no man is left behind.” That needs to be the motto of our marriages. “No spouse is left behind.” We are to do what it takes to reflect the attitude of Christ. He told us He will “never leave” or “forsake” us. Read Philippians 2, so you can better see what God expects concerning our attitude. It is to be sacrificial. May God help us to put forth the best attitude and effort possible within our marriages to His glory!